Former President Olusegun Obasanjo on Friday surprised many when he outpaced younger people during a health walk held in Abeokuta,Ogun State capital. 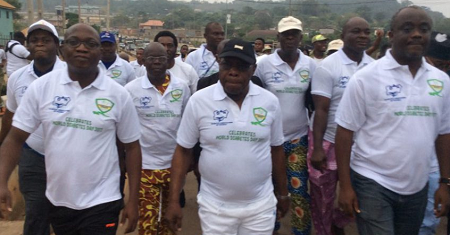 Mr. Obasanjo who is 80 years old, led about a hundred residents on a two kilometre trek on Moshood Abiola Way, to commemorate World Diabetics Day. But he shocked many participants when he introduced brisk walking that left some panting and racing to catch up with the retired general. The participants included the traditional ruler of Iwo, Adewale Akanbi who later had to fold his regalia and hand over his staff of office to his aide, to enable him reach the energetic former president. Many of the older participants later withdrew midway into the trek, realising that they could not match Mr. Obasanjo’s pace. ”I am fit because I religiously follow my medications and watch what I eat and drink. This must be a caution for all of us,” he said.